For pups on the smaller end of the spectrum or larger ones that are watching their figure, it can be tough to find a dog chew that's just the right size. That is until these delicious bully sticks for dogs came along! 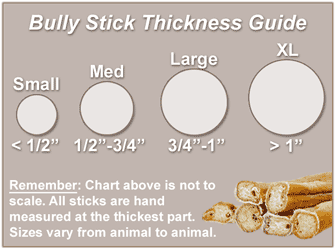 Available in a medium thickness, our 5" Straight Bully Sticks are perfect for smaller pups who love to chomp on everything in sight. But unlike your favorite pair of slippers, our bully sticks are free of anything artificial--meaning zero chemicals, preservatives or hormones. The only ingredient? Delicious, tasty all-natural beef pizzle that your pup won't be able to resist! 5" x 0.625" x 0.625"